I finally found some time to tune into the new tvN Friday / Saturday night drama Gap Dong and I have to admit that I am intrigued. 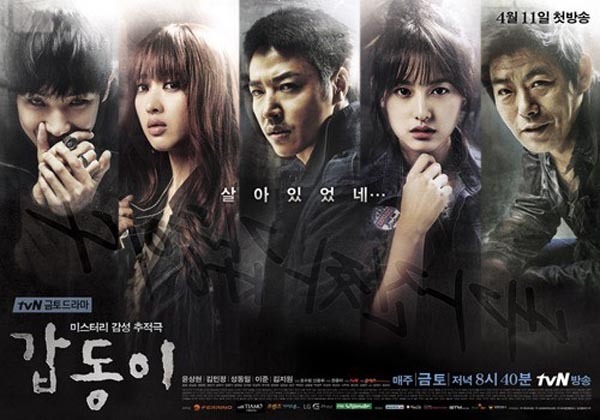 tvN has produced some pretty solid shows in the last couple of years so I came into this drama with some high expectations, I am happy to report that I was not disappointed (but hey, I am a realist, so this show could take the low road in the end). Henceforth are my first impressions of Gap Dong. Cheers! Moo Yeom’s Father was accused of being the Gap Dong serial kill. Now deceased, Moo Yeom’s Father has had the suspicion of guilt hover over him for years. Moo Yeom has secretly harbored his own suspicions of his Father’s guilt, yet he has consistently attempted to prove his Dad’s innocence. 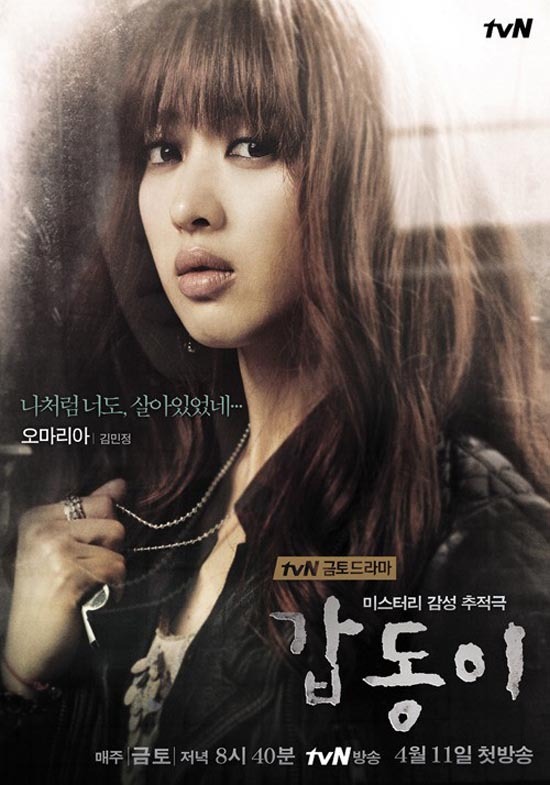 Moo Yeom works as a detective, showing a street smart and compassionate side to those around him. 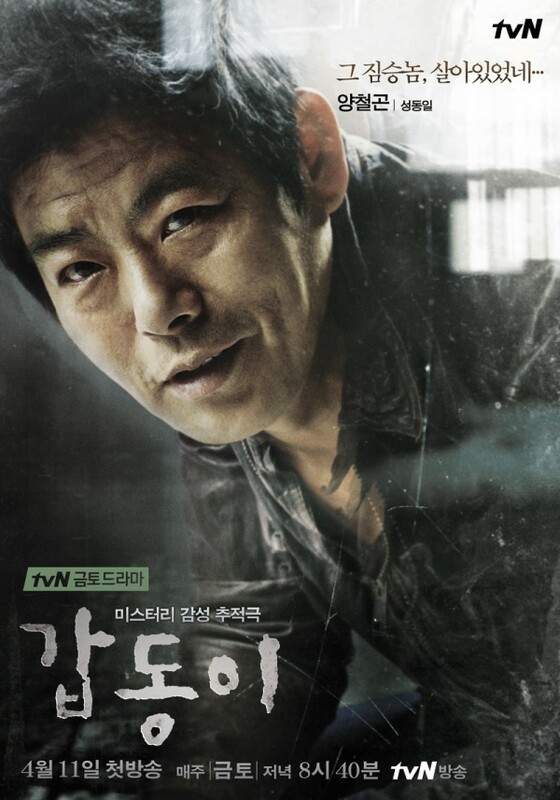 Determined, Moo Yeom will stop at nothing to prove his Father’s innocence once and for all. Maria appears to be a concerned and diligent Psychiatrist, however she is harboring a painful past. As a child she was abducted by Gap Dong and only survived due to the death of another girl. Obsessive over the Gap Dong case, she works at a prison psychiatric hospital while hiding her past. 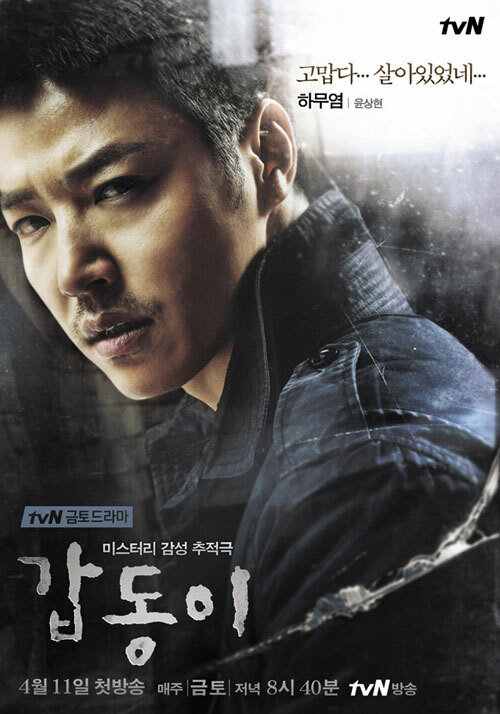 A detective on the original Gap Dong murder case, Cheol Gon is convinced of that Moo Yeom’s Father was the culprit. Having risen to become a well-respected officer, he requested that his last assignment be to the team in charge of the Gap Dong case- so he can solve the mystery and prove his theory once and for all. A patient at the prison psychiatric hospital Maria works at, Tae Oh seems to have a fascination with the Gap Dong case. Apparently border line psychotic, his motivations and intentions are unknown. 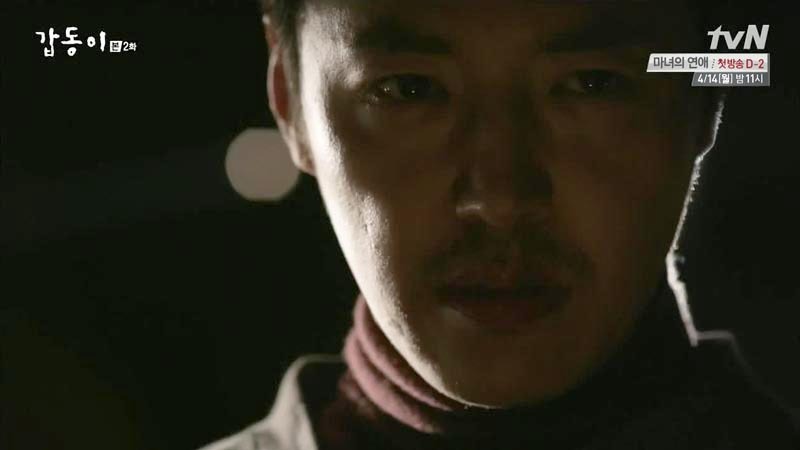 Ha Moo Yeom has grown up with the knowledge that his late father was the suspect in the infamous Gap Dong serial murders. Yang Cheol Gon is the detective who was certain that the (technically unsolved) Gap Dong murders were the work of Moo Yeom’s father. As seventeen years come and pass the two find themselves working in the same department- both on a mission to once and for all close the Gap Dong case. Cheol Gon has risen through the ranks and requested to take charge of the team who handles the Gap Dong case; Moo Yeom has spent years as a street smart and determined detective. Moo Yeom and Cheol Gon despise each other because of their past; Moo Yeom is convinced his Father was innocent while Cheol Gon sees Moo Yeom as a beast like his Dad. A wrench is thrown into the case when the Gap Dong murders seem to suddenly pick up again. To complicate matters there is a surviving witness to one of the Gap Dong murders – however the witness is unreachable. Only a girl at the time of the incident she has grown into a woman who is bent on protecting her past. The long ago witness now goes by the name of Maria Oh. She works as a psychiatrist at a prison mental facility. A resident at the facility, Tae Oh, seems to be fascinated with her and the Gap Dong murders alike. Is he a copycat murderer who worships Gap Dong or has the man himself returned with a vengeance? So far the story has been delivered in a solid and well thought out manner. While we are seeing the plot’s baby steps (setup) the execution, direction, and characters seem to be well planned. I am not getting the vibe that we are chasing a killer only to keep a convoluted mystery going (cough *God’s Gift 14 Days * cough). It seems that are actually following a story with logic behind it…with characters that mean more than the next plot twist and are poised for some major development as we increase in episode count. While this drama’s pace is not as intense as God’s Gift, I find it more watchable for that reason. Maybe I am too burnt out after GG, but I just want a murder mystery that does not try to shove plot twist after plot twist down my throat in a show of nonsense. I want some clues and something that makes sense in the end. It is early yet, but I get the vibe that Gap Dong is going to do a whole lot more thinking before it throws out the next suspect and clue- and I will greatly appreciate that if it is true. Regarding the characters, the tension between Ha Moo Yeom and Yang Cheol Gun is an intense watch. The animosity is just oozing out of the screen when these two appear together. Something tells me that this duo is not going to be hugging it out anytime soon- but I am fine with that. It makes for some interesting television. Are either of them the bad guy? Not really, given the fact a murderer is on the loose. Yet they are both each other’s antagonist and that dynamic intrigues me greatly (I cannot wait for later episodes when their conflict will likely intensify). Lee Joon as a psycho killer has given me life. Which seems wrong to say considering his character is busy taking them (probably taking them, I guess we don’t have complete confirmation he is offing those girls he seeks out). This man has the face to play a cold hearted psycho path, and I am loving every minute of it. Yoon Sang Hyun is giving a thrilling performance Moo Yeom. I like this actor and his last role as the unlucky-in-love lawyer (in last year’s I Hear Your Voice, which ironically was written by the same person behind Gap Dong) was a bit of a letdown in my opinion, given what I thought he could do given the right role. So far I am much more behind his portrayal of this character as compared to his last spot in drama land; I am eager to see more of how he pulls of this determined and tortured soul. Maria is no less of an interesting character. As the one that got away (through the most twisted game of rock paper scissors that I have ever seen) she has to have a whole lot of complex inner turmoil. I will admit that I was skeptical as to how this woman decided becoming a doctor at a prison mental facility was a good idea (yunno, because she was almost the victim of a serial killer so being surrounded by crazy prisoners seems like…a bad idea?). So far it looks like she may have chosen her profession based on a need to find the culprit, which I guess is a nifty new reason to go to med school?! Either way I wonder how this character will turn out as the story progresses. She must be full of a burning desire to see the killer captured, but as of episode 2 we have not been given any indication of her deeper thoughts on the matter. I slow clapped at how the story alluded to how Moo Yeom’s quest to discover Gap Dong was similar to reuniting with his first love. As strange as that sounds (given the fact he is trying to find a serial killer) I was impressed with the analogy; for this character clearing his father’s name and finding the real killer is akin to returning to his first love- that one obsession he could never quite forget no matter how hard he tried (or no matter if the statute of limitations ran out). If this is a hint of how clever the story is going to be and how interesting the characterizations will play out you can count me a fan until the end. Have you tuned into Gap Dong? Thoughts? Let us know in the comments! « Running Man Headlines: Join the Discussion. Yes, I mean you.